Had a great time at the UMass Football Banquet last night. I'll try to have some images up tomorrow. Rhode Island promoted from within yesterday as the Rams appointed DC/Assistant Head Coach Joe Trainer the 19th HC at Rhody. Josh Buchanan's "Small School" NFL draft list. Mike's UMassHoops site has a thread about UMass football Jerseys being available at Dicks in Hadley Mall. Supposedly they are on sale for $45. My birthday is next month. I'll have to mention this to Mrs. Blog. Liam Coen didn't get an invite to the Combine. Tonight is the UMass Football Banquet. Hope to see some of the Blog community there. The UMass Daily Collegian has a story on the 2009 UMass Schedule and the staff hirings here. 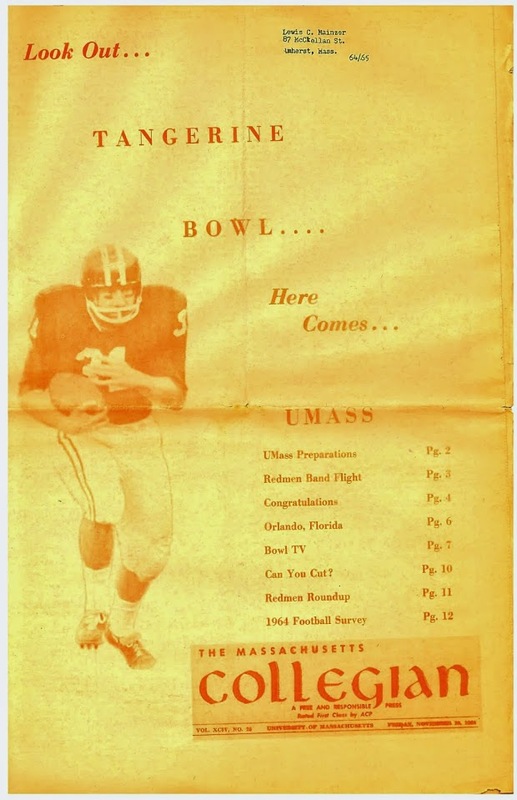 The UMass Athletic Dept website has an article on the 2009 schedule here. Matty Vautour has an article on the schedule and staff changes here. 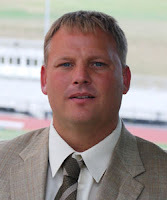 Rejoining the UMass staff will be Steve Tirrell, who was with Coach Brown from 2004-2006. For the last two seasons he has been assistant Head Coach at Nichols. Tirrell was formerly DC for Brown and has also been an assistant coach for Coach Whipple (1996-1997). This seems like a good hire. Tirrell is familiar with UMass football and many of the current staff. Joining the UMass staff for the first time will be Dyran Peke. For the past four seasons he has been the corn erbacks coach and special teams coordinator for Delaware. Last year Coach Brown was the DB coach and Sean Spencer was the special teams coordinator. Peke has recruiting connections in Virginia and Florida. He has been DB backs coach at Cornell and Delaware. Seems like a good hire. I did a little checking about the Albany game being moved to McGuirk. Last year the Great Danes home attendance averaged 3,165. They drew 5,111 for what was probably their biggest home game against Hofstra. The 2008 UMass-Albany night game at McGuirk drew 15,111. UMass undoubtedly thought that revenue from the sixth home game would exceed any sweetening of the guarantee paid to Albany------ and the Great Danes felt they would do better taking the offer. BTW, my images of the UMass 28-14 victory are still available here . It's official: Tennessee Tech will be Kansas State's second FCS/I-AA game in 2009. Three UMass football players were honored at UMass Fall Academic Honors luncheon on the 25th. Richmond DE Lawrence Sidbury did well in the NFL Combine and may have moved up to a 2nd-3rd round pick. JMU's Mickey Matthews received the Liberty Mutual FCS Coach of the year award. Attention UMass Equipment Manager Paul Bys: Nuclear Grade Duct Tape. Football Scoop reports that Duke Assistant Coach John Gutekunstis interested in the Rhode Island HC position. Six home games in 2009! Jeff Thomas reports that UMass has arranged six home games in 2009. The previously scheduled Sept 12th game at Albany has been switched to a home game. Nice schedule. The three September games are sure to be night games and should bring a good crowd. Kudos to the Athletic Dept for getting the Albany game moved! Dave Coulson talks about the Hens-Hornets game, FBS transfers and Darren Rizzi leaving Rhode Island. Yesterday, I blogged about Delaware and Delaware State playing their first ever regular season game in 2009. Now they've signed a four year contract. Video interview with Thorr Bjorn about the coaching change in Rhode Island. Also: URI cuts four sports. Do you lift? I do. The top bench press performances at the NFL Combine. I blogged earlier that Kansas State may play Tennessee Tech as a second FCS/I-AA game. It's official: Kansas State announces their 2009 schedule. Two former UMass administrators, Bob De Carolis of Oregon and Thorr Bjorn of Rhode Island share the Harold J. VanderZwaag Distinguished Alumnus Award from the UMass Sports Management Program. Former UMass DE/LB Mike Dawson has been hired by the Boston College Eagles as an assistant special teams coach. BC Blogger "Eagle in Atlanta" comments . Brandon London has been re-signed by the Miami Dolphins . Questions and Answers with Richmond RB Josh Vaughn. Former UMass assistant coach Robert Talley is being mentioned as possible replacement HC at Rhode Island. BTW, former UMass WR Neal Brown did interview for the UMass Head Coaching job last month. Brown is still the youngest OC in DI football. Delaware and Delaware State will play their first ever regular season game this year. UMass football recruit Tom Brandt ran a 7.88 55-meter hurtles recently. Northeastern's star TE Brian Manderville received bad news at the combine. A routine medical check indicated he has a heart valve problem. Not only will he not be drafted; he was advised to give up football. Nasuha South RB/DB David Zocco has a decision to make. Montana and Appalachian State are looking to set up a home-and-home series. Woah! Darren Rizzi, HC of Rhode Island has resigned to be special teams coach with the Dolphins. Stories here and here and here and here. URI athletic dept article (with quotes from Thorr) here . Miami Dolphins article here . I believe NCAA rules allow recruits to void their letter-of-intent when the HC leaves. Rivals Rams commits here . This year's NFL Combine top performers. Eastern Washington is appealing its post-season ban. UMass and UCal Berkley have joint patent rights to a technology that may transform your data storage. David Coulson of The Sport Network ruminates about changes in the Ivy league and the end of the Gaels Football Team. C.W. O'Brien of the Bleacher Report says the BCS will never have a playoff. The UMass-Holy Cross series takes a year off, but you may be interested in the Crusaders Spring Outlook anyway. James Madison has its official 2009 schedule up, confirming that the Dukes will play at McGuirk on November 19th. Texas Tech's super receiver Michael Crabtree didn't measure up at the Combine. The Music City Bowl of Vanderbilt against Boston College bombed financially. UMass opens at Kansas State on Sept 5th. This article has the first preview of the '09 Cats that I've seen (mentions UMass). FWIW, they are saying on message boards that K-State will play Tennessee Tech (3-8 last year) at home on Sept 26th. Two FCS/I-AA teams will not make the Wildcats fans happy. There's no confirmation of this that I could find. Mrs Blog and I have made plans to take in four away games so far: Albany, K-State, Richmond and Delaware. The New England Patriots report signing former UMass TE Brad Listorti. Pats bio here . UMass bio here. T.J. Clemmings was offered a BB scholarship by UMass. He may end up playing football for Notre Dame. CSN columnist Chuck Burton contemplates FCS recruiting. Rivals CAA North 2009 recruiting commits pages. Charleston Southern will play Florida, Wofford and the University of Southern Florida in a three week span this fall. They also play play UMass' unofficial common opponent Stony Brook on Nov 19th. The CAA website has an article with links about Northeastern's Brian Manderville and Richmond's Lawrence Sidbury at the NFL Combine. Speaking of Northeastern, they open at Boston College on Sept 5th. Speaking of Boston College, no one likes their recruiting this year. New Hampshire has their 2009 schedule up. Sports Illustrated has three CAA players on their "Small School Draft Prospects"
Josh Buchanan of NFL Draft Bible has his "Small School NFL Draft Board". He also has a review of the Southern Conference 2009 recruiting. Speaking of the Southern Conference, Furman plays Missouri and Auburn this year. The Maine Black Bears play Syracuse on 09/26/09. When the football season is over, I just can't get into other sport's playoffs and championships. The UMass athletic website crashed my browser this morning. This article mentions UMass recruit Jamar Smith (page 2), but the author keeps mentioning UMass and Akron in the same sentence. Last I heard, the Zips were not a FCS team. I've blogged before about the Charlotte's 49's starting a football team. They'll start in FCS/I-AA. To get a seat between the 30 yard lines, it will cost you $2,500 for a seat license plus a mandatory $1,500 pledge to the athletic dept. That's $4,000 and then you still have to pay for the season ticket! It will cost you $500 plus the cost of the season ticket to sit between the 30 yard lines at Appalachian State. This I did not know: if a team is placed on a post season ban because of violations of NCAA rules, players can transfer and be eligible to play immediately. See this article about a potential raid on Eastern Washington. I just blogged about Eastern Washington's troubles last Friday. 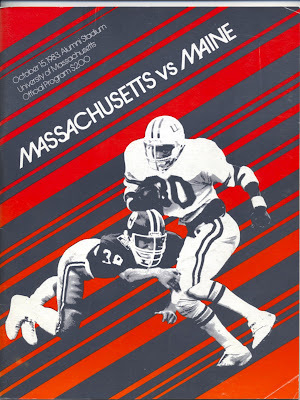 I've added fourteen scans from four different 1983 game programs to the "UMass Football History" folder. The link is here. The new scans are marked 1983. Be sure to use the magnifying glass option for larger views of the scans. Clicking and dragging the image allows easier reading of the captions or text. The historical section now totals 84 scans covering 1971, 1973 and 1976 through 1983. UMass finished 3-8 in 1983. We had wins over Harvard, Maine and Boston University. Losses were to Toledo, Holy Cross, Rhode Island, Delaware, UConn, Lehigh, UNH and Northeastern. UMass Captains were Grady Fuller (1st team All-YC), Richard Jenkins and Gary Freker. Bob Picket was Head Coach. Assistant coaches were Mike Hodges, Jim Reid, Bob McConnell, Kevin Karwath, Doug Berry and Steve Telander. 1983 was the last year of Bob Pickett's six year run as head coach. No UMass-specific football news on the wires this morning. Mrs. Blog, who I love dearly on this Valentine's Day, has a big "Honeydo" day in store for me, so I do not have the time to develop any original content. The UMass Football Wikipedia article could use some help, if you have nothing to do. I'll be back tomorrow with some UMass historical scans. The Sporting News has two articles discussing the meltdown at Eastern Washington here and here. Eastern Washington's post season ban will probably effect 2009's playoff bracket. It could reduce the Big Sky league to one team in the playoffs. The NCAA has changed the uniform colors rule to allow the visiting team to wear their home jerseys if both teams and the league agree. Northeastern has released its 2009 schedule. This is the most manageable schedule the Huskies have had in a number of years. For the last five years or so Northeastern has played the toughest OOC slate in the nation. You remember last spring I published a tour of the UMass clubhouse, which is still available in the Blog's sidebar, Hofstra has a tour of their facilities here . Rhode Island has released its 2009 schedule. That, along with the leak of Northeastern's schedule, allows most of UMass' 2009 football schedule to be determined. Thanks to several Blog readers for their e-mails on this. Some notes on the schedule: Delaware was originally listed on the Hens site as 10/31 and then was moved to the 10/10 date. The rumor is that Stony Book will be the fifth UMass home game, but no information on either school's website. An unofficial look at the CAA's 2009 schedules here . It always seemed to me that the CAA South teams rarely came north in cold weather. I took a look at the past schedules of this year's CAA South opponents. James Madison- 12 games, four in November. Latest date of the Dukes playing at McGuirk: November 5, 1994. We won 27-24. Richmond - 21 games, eight games in November. Latest date of the Spiders playing at McGuirk: November 21, 2001. We lost 7-35. That was the only time UMass played any of the Richmond, Delaware, JMU trio as the last game of the regular season. In 2008 Texas Tech played two FCS/I-AA opponents: UMass and Eastern Washington. The Eagles just got hit win NCAA sancions. More here . Maine will receive $450,000 and not have to play Florida State. Good deal for the Black Bears! No UMass football news of note today, so let's return to Monday's look at the redshirt freshmen that will be available this spring. I will repeat the cravat that I have no knowledge of any gains or losses in the listed roster. Julian Colarusso WR. The Quincy, MA native is tall, 6-4 and was a Boston Herald All-Scholastic in 2007. Cedric Gonnet TB. No bio on the UMass website. 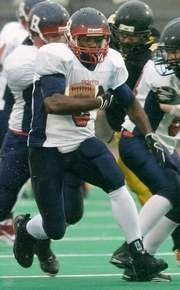 He was first team All-Group IV South Jersey in 2006. Note Julian Talley in same article. Zack Johnson K/P. No bio on the UMass website. Stephane Milhim OL. At 6-4 325, Milhim is the size Mark Whipple favored for OL. Sean O'Conner OL. The 6-7 O'Neal has "length', which is the current hot atribute in offensive linemen. Gilbert Parson OL. First Team All-New England in HS. Quinton Sales OL. Sales was a Rivals three star player and the highest rated position ranking (#15 center) signed by UMass last year. Kevin Macon OL. Macon is probably an instant starter on the OL. One of the highest rated players we signed in 2006. Obviously, the strength of the redshirt freshmen on the offensive side is linemen. We return Valdimir Ducasse Sr., Rob Getek RS Sr., John Ihne Jr, and Josh Samuda Soph. as starters on the offensive line. One article (no link) said Cedric Gonnet was injured back in HS in 2007. If fully recovered, he could be in the mix at TB. The Worcester Telegram briefly mentions two UMass recruits here . Maine's Jovan Belcher is training for the NFL. Remember there were rumors that UMass OL coach Brian Picucci was leaving for Boston College?It turns out UNH's Sean Devine was the coach hired. The CAA insider ranks UMass' recruiting class pretty low. Note that all of the CAA South teams received high rankings and all the CAA North received low. The CAA has released the 2008 CAA All-Academic list. Honored for UMass were Sean Callichio, Chris Cefalo, Peter Chiaro, Arron Fears, Brent Arnold, Jeromy Miles and Anthony Rouizer. Congrats to all the UMass players who made the list! No UMass news on the wires this morning. I thought it would be interesting to look at 2008's redshirt freshmen. Note that the roster list has not yet been updated for spring. I have no information about any gains or losses after the season ended. Chris Chamberlin LB/LS. First Team All-New England and numerous honors in HS. Kumar Davis DB. 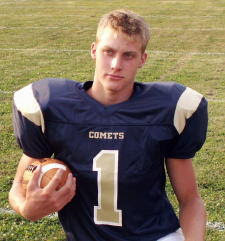 A Rivals two star recruit in '08. Should be in line for some playing time this year. Charles Thompson DL. Thompson was a Rivals listed player and a member of numerous HS All-star squads. With UMass losing two starters on the DL to graduation, he should be in the mix for significant playing time. Players without bios are probably walkons. Adeoba, Chamberlin, Davis and Thompson should be players to watch in the Spring Game. With no defensive JUCO's or I-A transfers so far, those players should be the available reinforcements for 2009. Matty Vautour took a look ahead to 2009's possible new starters back on 11/25/08. UPDATE: Did you ever think about staying in school and getting an advanced degree?-- No? ----- Good choice. This Union Leader article states that UMass is interested in Ian Ginnard a 6-2 225 pd LB from Souhegan HS as a recruited walk-on. This article features him. College Sports News has a national FCS/I-AA 2009 signing list here . Delaware, William & Mary and Maine recruited well in South Jersey according to this reporter. If you missed it, Penn State QB Pat Devlin transferred to the Hens a couple of weeks ago. This ESPN article lists the do's and don'ts of recruiting. David Coulson of the Sports Network discusses FCS recruiting. New Hampshire Football Report has a story on UNH's 2009 schedule. Remember Matty Vautour had a story about UMass possibly playing Michigan in 2010? The Delaware State Hornets are playing in the Big House this year. Recruiting ratings and results on the field; this article looks at record. In our 1998 National Championship year we met and beat Northwestern State in the playoffs. For a number of years they had a top-10 FCS/I-AA team. The Demons usually did it with defense. Northwestern State has fallen on tough times recently. They now have a new coach Dale Petevo, who was previously the DC at LSU. The Demons also have the #1 rated recruiting class in FCS/I-AA. UMass was #3. This link goes to a YouTube clip of a 1993 CBS News report. Intrepid CBS reporters explain how "tech savvy" people are using their "personal computers" to "log on" to something called the "internet". What possible use could the average person have for the "Internet" ? About 1:30 into the clip, one expert says "Suppose you wanted to talk about football". Yeah right, the US military spends billions on a word wide computer network and people are going to use it to talk about football to persons they've never met. Like that's ever going to happen. The Springfield Republican has more news about western Mass players including Alex Scyourka, who many thought would get an offer from UMass. The Laconia Citizen has a nice article about UMass recruit Christian Birt. That's what football should be all about: bringing people together. Another article mentioning Birt here . Jeromy Miles is on Draft Daddy's Juniors-to-watch list. Don't remember if I mentioned this before, but former UMass assistant coach John Zamberlin is head coach of Idaho State. I sat with him at an athletic dept function back in the day, and had a fairly long talk about UMass football. We signed more players than Boston College did. Matty Vautour says he doesn't know how well UMass did with this year's recruits. Matty Vautour has an article on the UMass recruits and says UMass is still pursuing several more players. Jeff Thomas of the Springfield Republican has an recruiting article here . The Metro Daily New has an article about the Brandt brothers signing with UMass. Kevin Stevens of Press Connects says Jamar Smith is happy to be a Minuteman. The Worcester Telegram has an article on Rob Blanchflower and Brandon Potvin signing with UMass. The Boston Herald discusses New England college recruits including UMass. I did not add Brandon Potvin to the recruits list. Sorry Brandon! I was getting a little tired. Brandon Potvin DT. He's Worcester Telegram's Defensive Player-of-the-year. Sean Unterkoefler RB. I had him listed as a LB although he still may play there, but the UMass recruiting bio emphasises his RB skills. Ran a 6.14 55 meter sprint (20th in nation). YouTube highlights here . Rivals.com has us as the #3 rated recruiting class in FCS/I-AA. One of our 2009 OOC opponents Albany, signed eleven. The UMass Athletic site has the 2009 UMass Recruiting list up. Ok. Some recruits I've already blogged about. There is quite a bit of material to review on those players. 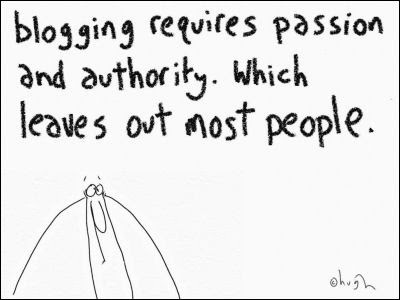 Click on their name and Blogger will display past blogs about them just below the current post. Rob Blanchflower TE. Worcester Telegram article mentioning him here . He also played defensive line . Mike Lee DB. Youtube highlight video here. He's #13. (be sure to click on the "high quality" setting". He runs a 4.55 40 and Clemson and South Carolina were interested. Devin Lindsey LB. Rivals two star player. He was First Team All-State. Thad McCummings DB. He rushed for A LOT of yards at Canterbury School. Perry McIntyre LB. Rivals page here . He was All-Area on defense . Also All county. Jeff Strait P. Highlight video here . Good athlete too . Adham Talaat OL. Big dude. UMass Athletics has a video interview with Coach Morris on signing day here . Whew! I'm going to take a break. Everybody play nice. The Springfield Republican has a story on several Western Mass players and their college choices. James Madison beat out Boston College and Maryland (and former UMass head coach Don Brown) for a big DE from Harrisonburg, VA.
Last year's FBS/I-A opponent Texas Tech has the best football graduation rate of public universities. I have to go out to shovel snow now; I'll be posting later as soon as more information is available. UPDATE I: Northeastern has their 2009 recruiting list up. UPDATE II: Richmond has Signing Day Tracker set up with multiple recruits listed here . Winning the National Championship helped the spiders' recruiting states this article. UPDATE III: Our BCS/I-A 2009 opponent Kansas State has 25 players on their signing list. UPDATE V: New Hampshire now has its official 2009 recruit signing list up. 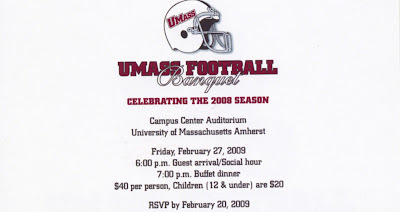 I'll be attending the UMass Football Banquet on 02/27/09. The food is always excellent and I enjoy talking to UMass players and fans. Call 413-545-2026, EXT 0 for reservations. UPDATE: Everybody is correct. I was thinking today was the 4th. So tomorrow is signing day. Well, it's Letter-of-Intent Day. And it's snowing again here in the great Granite State. I just updated the blog post on Jamar Smith. Scroll down. Most teams announce their recruits late in the day as it gets really crazy in the last 48 hours. Many recruits hold out for a I-A/BCS offer and then start a hasty re-evaluation when the call does not come. Many I-A colleges don't get recruits they want and make a last minute bid for local players. Boston College was famous for that in the past. Coach Jimmie Reid said UMass lost a couple of recruits at the end of the recruiting period every year. What really frosted his preserves was that the I-A school would ignore the kid during the whole recruiting period and then sign a UMass leaning kid in one day. FCS/I-A teams are allowed 63 scholarships over 85 players. So then the "perfect' recruiting class is 17 recruits. Gray shirts and walk-ons are not counted. Gray shirt definition here . This article from ESPN looks at why a recruit might disappoint. I'll be back later when UMass announces it's list. The school cannot comment on a recruit until they get the signed letter of intent. Jamar Smith a RB from Binghamton, NY has verbaled to UMass. Good name and he wears #5! Ran for 2,729 yards as a Senior. Interested were Buffalo, Maine, Northeastern and Rhode Island. UPDATE: New article about Smith's signing here . Image by Press and Sun Bulletin . His ESPN page is here . MaxPreps has his season totals for 2008 here . This article is a year old, but has Booth as its feature. Also having interest from Boston College, Lehigh, Villanova and James Madison. Please be advised my e-mail has changed as of this morning. All of New Hampshire switches from Verizon DSL to Fairpoint. My e-mail also changed. I've updated the e-mail link in the "About me" section.